The New Jersey Council of Collaborative Practice Group members attended the 2018 Seattle Forum of the International Academy of Collaborative Professionals. We spent the weekend learning and sharing and exchanging ideas with the global community. We received amazing collaborative training and participated in the inaugural global pin exchange. Lots of professionals were seeking out our NJ pins so next year we need to bring even more! 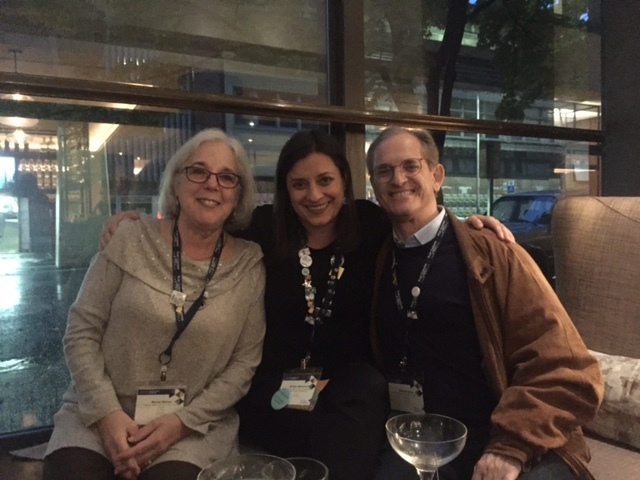 Collaborative Divorce Association of North Jersey had three members attend the 2018 Seattle annual IACP Forum this past October. Marcia Werner, Shireen Meistrich, and Mitchell Arons. There was lots of in depth learning and collaborative training available all weekend long. The full group will also meet on Wednesday November 7th to share the learning and wonderful training with our larger collaborative CDANJ community. We are already planning for the 2019 Forum in Chicago! Collaborative Divorce Association of North Jersey is proud to report that one of our founding members, Cathy J. Pollak, esq and a principal at Price, Meese, Shulman & D’Arminio, pc has been named one of “Ten Leaders of Matrimonial Law in New Jersey” by the Ten Leaders Cooperative in North and Central New Jersey. This honor was featured in the November issue of New Jersey monthly. Cathy’s concentration is in the area of family law utilizing her expertise in litigation, negotiation, mediation and collaborative law. She is recognized by her peers for her skills and experience and by her clients who count on her dedication and sensitivity to their situations and needs. In New Jersey, there are four ways to divorce: litigation, arbitration, mediation and collaboration. On Sept 10, 2014, Governor Christie signed the New Jersey Family Collaborative Act, to legitimize the practice of collaborative divorce. It is a type of alternative dispute resolution in which an attorney is retained to assist his/her client in resolving family disputes in a voluntary, non-adversarial manner, without going to court. Collaborative divorce identifies the goals and interests of both parties to arrive at a happy medium through open communication and a pledge not to go to court. Both parties sign a Participation Agreement, stating that they are committed to resolving the dispute through the collaborative process. The Agreement also stipulates that the attorneys will not represent them if the dispute is submitted to court, other than for the settlement agreement. The New Jersey Family Collaborative Law Act extends the privilege of confidentiality to all members of the collaborative team: the confidentiality of the collaborative divorce proceedings cannot be breached with the permission of the clients. In addition to the attorneys, the collaborative team may consist of a mental health practitioner and a financial expert, such as an accountant or financial planner. The attorneys function as colleagues rather than adversaries, while providing individualized legal counsel to and advocating for their clients. A mental health professional, as coach, helps manage emotional obstacles to arriving at a respectful dissolution of the marriage.. Strong emotions, so often present during divorce, can interfere with the ability to think logically and clearly. This is not therapy. A mental health practitioner, as the child specialist, may also be involved to assist with issues and concerns regarding the children. Collaborative divorce allows the parties the flexibility to work out their own solutions in a more creative way as opposed to being at the mercy of the court with judges who select options from statutes and case law. Couples maintain more control of their divorce. Collaborative divorce offers the possibility of minimizing costs when couples are able to work together, establishing options. Others savings include time, emotional and personal investments by helping the parties develop a fair, sustainable agreement that meets both their approval. Couples often enter divorce proceedings feeling like two separate entities with opposing missions. Collaborative divorce can bring them to a point of unification, being satisfied with the separation agreement and confident that it represents the best interest of all members of their family. It was a warm, sunny day, February 28, 2016, when twenty-eight members of the Collaborative Divorce Association of North Jersey committed to being indoors, largely without windows, for more than half of the day. Our annual Retreat, always in February, is a day of learning and team building. In the morning, our own Paul Kreisinger, Esq, LCSW presented “Love and Hate in the Collaborative Crucible”. In an engaging and informative presentation, including videos, he explained the need for attachment in humans and how it affects our interactions in relationships as well as how it plays out during divorce. Not only is a divorcing couple coping with their attachment issues, it is important for all members of the collaborative divorce team to be aware of their own sensibilities. We all have them and it is incumbent for collaborative divorce professionals to be self-aware to best help couples through the collaborative divorce process. If the couple has children, the benefits multiply as they are more likely to engage in better cooperative co-parenting, sparing their children much emotional stress. Discussion of this topic, was lively as members of the Collaborative Divorce Association of North Jersey are committed to continued advanced learning and offering the best service possible during a trying time for a family. After lunch, we broke into two groups to enter “escape rooms” where we had to work together, utilizing clues and codes, to be able to get out of the rooms. In addition to being fun, testing our observational skills, wits and patience, it is so important to be able to trust and work well together, to achieve resolution. 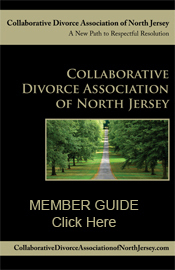 These efforts result in enhanced cooperation among the professionals of the Collaborative Divorce Association of North Jersey, and with clients, in the collaborative divorce process. I had the pleasure of attending the 2015 International Academy of Collaborative Professionals [IACP] Networking and Educational Forum held in Washington, DC, from October 16-18. It was my first Forum experience since joining the Collaborative Divorce Association of North Jersey [CDANJ] in May, 2014 and it was more than worth my time. Upon arriving in Washington DC, the first session I attended was a Meet & Greet with Stuart Webb, the founder of Collaborative Divorce. To say that I felt out of my element and a little intimidated was an understatement. After speaking with Mr. Webb and the other speakers for the session, I instantly felt comfortable. the session included singing a song, meditating and interacting with others. I connected with people on a level I probably never would have otherwise. That Meet & Greet session jump-started my Forum weekend and got me energized to learn more about the process and meet more colleagues. For my first Forum, as a new financial collaborative professional, the majority of the sessions I attended focused on the financial aspect of collaborative practice. My goal was to learn the most I could, in the financial area of the process, to better my skills and to spread the knowledge to other members of the CDANJ. The weekend was so motivating, watching attorneys, financial and mental health professionals, from all over the world, come together to teach and better collaborative practice. The sessions were mentally stimulating and the speakers were inspiring. I look forward to attending IACP Forums in the future and will focus on attending more sessions that are outside my comfort zone; I believe that they will greatly contribute to my being a more well-rounded professional. The next IACP Forum will be held in Lake Las Vegas, NV, from October 17-30, 2016. The Collaborative Divorce Association of North Jersey held a seminar, for its collaborative attorneys, entitled “Ethics and the Collaborative Law Attorney”, on April 21, 2015. The Association’s president, Larry Esposito, esq. integrated Opinion 699 of the Advisory Committee of Professional Ethics with relevant New Jersey Rules of Professional Conduct, the International Academy of Collaborative Professionals’ ethical standards and the recently passed New Jersey Family Collaborative Law Act. Discussion of a variety of ethical issues included: screening before a client signs onto the collaborative law process, confidentiality, discovery, cut-off dates and advocacy. Attorneys attending appreciated the breadth and depth of the seminar. 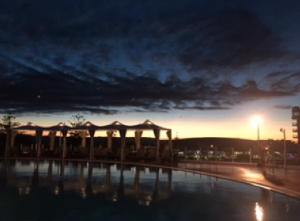 This is the sunset view on top of the Sofitel hotel in Broadbeach,Australia to kick off the welcome to the IACP Australian Institute event this past April! There were 120 participants learning and exchanging ideas, concepts, and theories about collaborative process and collaborative divorce. IACP members from Australia, Singapore, Hong Kong, England, Scotland, Canada, and The United States gathered for some in depth all day programming that aimed at honing and expanding their collaborative skills. I took a course on the Challenge of Teams and a course entitled the Psychology of Conflict. Both were enriching and intellectually stimulating as we exchanged ideas and experienced a deeper understanding of how the collaborative process is experienced throughout the world. I really appreciate the depth and the intimacy that the Institute learning has to offer, which is different than the Forum, but equally inspiring. For those interested in taking their collaborative divorce skills to the next level, I highly recommend attending the next Institute. The New Jersey Council of Collaborative Practice Groups held its annual state dinner on March 18, 2015, at Maggianno’s in Bridgewater, NJ with Ross Evans, esq as the featured speaker. Ross was a former president of the International Academy of Collaborative Professionals [IACP] and has practiced collaborative law for many years,in Cincinnati, Ohio. His topic was “Public Education: Building Awareness in Your Professional Communities”. Attendees included collaboratively trained attorneys, mental health and financial professionals. The Collaborative Divorce Association of North Jersey was well represented and members were enthusiastic about Ross’ guidance in helping other professionals and the public discover the benefits of collaborative divorce. Ross emphasized the importance of informing and educating the clergy who are close to those going through divorce and in distress. Collaborative professionals can ease the stress of couples who are divorcing, and their families, as well as mental health professionals and the clergy who are also there to help. On Sunday, February 8, 2015, members of the Collaborative Divorce Association of North Jersey convened for their Annual Retreat at the Bergen County Bar Association in Hackensack. Featured was Victoria Smith, esteemed collaborative attorney, author and lecturer from Toronto, Canada, with over thirty years of experience. The topic of Victoria’s day-long presentation was “Exploring Collaborative Advocacy”. The program focused on how the role of advocacy, in the Collaborative process, differs from advocacy in the tradition litigation model. Members of the Collaborative Divorce Association of North Jersey who participated gained a better understanding of how the role of the advocate is redefined when applied to a Collaborative Divorce context. Attendees also received training about the spectrum of advocacy in the Collaborative process, ranging from Facilitative Advocacy to Partisan Advocacy. Other skills honed at the Retreat included screening techniques for clients in the Collaborative process: working with a variety of clients who could be considered accommodating, bullying or those with unrealistic expectations. The feedback received from attendees was overwhelmingly positive. A day-long upcoming training, which the Collaborative Divorce Association of North Jersey is co-sponsoring, with the New York Association of Collaborative Professionals, is entitled “Conflict Transformation”. The program, on February 26, 2015, in White Plains, New York, features a former President of the International Academy of Collaborative Professionals, Nancy Cameron. Nancy is an internationally acclaimed Collaborative law expert, lecturer and author who will be speaking about conflict resolution strategies which practitioners can apply to all types of family law disputes.